Oscar’s Swing Jazz Ensemble has steadily built an enviable reputation as arguably the finest swing jazz outfit in the Northwest, presenting the glittering repertoire of the ‘30s and ‘40s Swing Era with a stylish flourish. Based in Manchester, the band has developed a stage-show encompassing the very best of the Golden Age of Hollywood, evoking all the glitz and glamour associated with the Broadway Musicals which first brought this fabulous repertoire of songs and tunes to prominence. 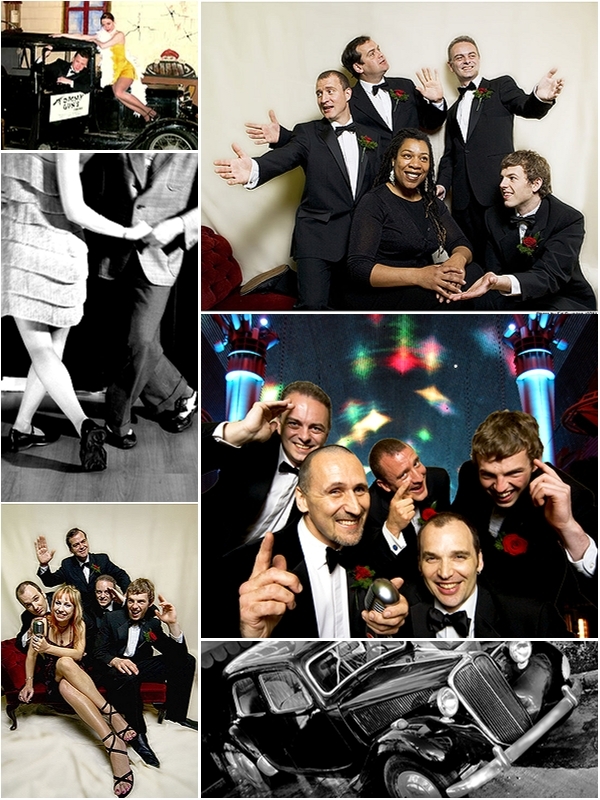 Find out more about booking Oscar’s Swing Jazz Ensemble for your wedding. All the favourite, iconic masterpieces are represented in a veritable feast of ‘Ratpack’ classics, from ‘Fly Me To The Moon’ through ‘The Girl From Ipanema’ to ‘Mack The Knife’. The finest songwriters of the age, such as George Gershwin, Irving Berlin and Cole Porter, are all represented in a stellar compilation of swing, Latin jazz, jump-jive and blues: it’s a musical ‘Who’s Who’ of the ‘tweenwar years. The vibrant energy, lyrical virtuosity and irresistible rhythms of swing jazz appeals to most age-groups and musical tastes, and equally to dancing or listening audiences. As an overall crowd-pleaser, it’s difficult to beat. Successful performance of swing jazz relies on a balance between the creative improvisation of the topline instruments with effective arrangements of the basic material, which itself depends on the band’s line-up. Well-defined craftsmanship in their unique arrangements is the trademark of Oscar’s Ensemble, fronted by a choice of male or female vocalist. The musicians are equally at home entertaining guests with background music during a champagne reception and formal meal as playing a more up-tempo set for dancing later in the evening. For musical entertainment during the various stages of a wedding celebration, Oscar’s Swing Jazz Ensemble can be an ideal choice. The band can boast a wealth of experience both in creating and sustaining a festive atmosphere at the reception and in cranking up the energy levels for the dancing and general revelry of the party. For a liberal dose of nostalgic glitz and glamour delivered with more than a touch of class, Oscar’s Swing Jazz Ensemble can be relied on to evoke the spirit of Hollywood’s Golden Age. With an extensive repertoire including effective arrangements of all the timeless classics, performed in an eminently danceable style, the band is guaranteed to delight and entertain any audience. Oscar’s Swing Jazz Ensemble is the perfect band to really get the party swinging!